Advanced Vein Center of Medford Oregon | Treating varicose and spider veins. Advanced Vein Center of Medford Oregon | Treating varicose and spider veins. and set your sights on feeling great! learn about our vein treatments. in a friendly and comfortable environment. If you have varicose or spider veins, you’re not alone. You are one of over 40 million Americans with the same health issue. The good news is that today’s technology is providing a wide variety of non-invasive solutions which make treatment easier and more effective than ever before. At the Advanced Vein Center in Medford, Oregon, we can help. Our site provides information about varicose and spider vein health issues and the vein treatments. Many insurance providers cover vein treatments with a referral from your physician. Get answers to all your questions about vein disease and treatment options. Call us at (541) 930-8900 to book your spot, meet our doctors and learn about the latest treatment options available. 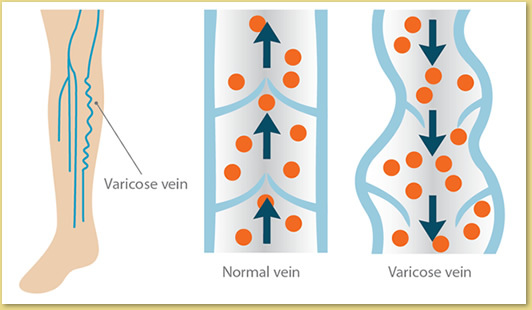 Varicose veins are enlarged, ropelike veins that occur in the legs. Often dark blue in color, they appear near or raised above the surface of the skin. Varicose veins don’t occur suddenly. In fact, they usually take years to develop. Although they’re often inherited, anyone can get them. And they’re common for people who have had certain types of leg injuries or deep-vein blood clots. Spider veins are the threadlike red and purple blood vessels that occur in patches on the legs and the face. They are often as delicate as a spider’s web, which is how they get their name. The patches also resemble tiny sunbursts, tree branches, or simple lines.